Having effective malware protection is important for any device connected to the Internet. Malware is a malicious software, such as a virus, which is specifically designed to disrupt or damage a computer system. Have you been surfing the net and you suddenly realize that your computer is installing some add-ons or toolbars you know nothing about? This is what this is all about. Bad downloads and installations that can leak your private data, change your browser and computer settings, or add unwanted extensions or toolbars to your browser. But you can take some steps to protect your software from malware and uncommon downloads. The good news is that some browsers have inbuilt functionality that will enable you to stop this or at the very least warn you about potential threats to your computer. You can protect your computer by allowing Google Chrome browser to warn you about unusual or potentially dangerous downloads. I have already told you that some of these downloads can be dangerous to your computer and even invade into your privacy. It is a good idea to turn on phishing and malware detection in your Google Chrome browser. You may be thinking, what is phishing? Phishing is the fraudulent practice of sending emails purporting to be from reputable companies in order to induce individuals to reveal personal information, such as passwords and credit card numbers, online. You can think of it as what the scammers do or what we popularly call the “Yahoo boys”. So you must have realized that malware and phishing are not to be taken lightly because it is actually one of the main problems and disadvantages of surfing on the internet. When you take protect steps to save yourself from these, you will enjoy the web better and always have happy surfing without being slow down by unwanted toolbars and add-ons. Oh, it is very annoying. How to turn on phishing and malware detection for Google Chrome in 4 easy steps. Click the Google Chrome menu on the browser toolbar. A drop down menu will appear, select Settings. This will open a new tab for you with chrome settings. Click on Show advanced settings and navigate to the Privacy section. 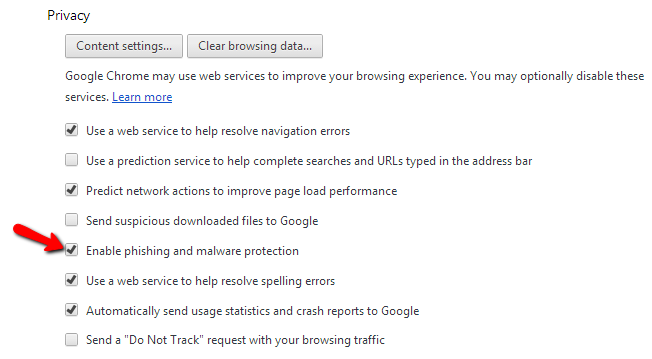 Select the “Enable phishing and malware protection” checkbox. Note: When you turn on phishing and malware detection, you may receiving message alerts like Malicious Download warning, meaning that you attempted to download a malware that would have otherwise harm your computer. You can also receive an uncommon download warning meaning that you attempted to download something from an unfamiliar and potentially dangerous website. You should only and always download programs from the sites you trust. If for any reason whatsoever you don’t want to receive these messages again, you can go back to Settings and then Privacy to deselect “Enable phishing and malware protection.” Checkbox. I hope this tutorial will help someone out there to protect his or her privacy while surfing on the net. Do you know of any other clever ways to protect yourself online or scan websites for malware? Please share it by leaving a comment.